Whilst we go about our busy lives, a host of unmanned space probes are investigating other worlds. Oxford astronomer Joseph Caruana takes a look at some of the spacecraft currently exploring our Solar System. Homo Sapiens has always been on the move, from the time our species migrated out of Africa more than 50,000 years ago, to later times when seas were traversed, oceans mastered and new continents discovered. Not only were the intrepid explorers of our species unfazed by the unknown, but they embraced the challenge it posed and with much bravery they set their sights on ever more distant and dangerous terrain, from the poles of our planet, to the very peaks of its crust. Thus, these brave men and women widened our knowledge and gave us unprecedented views of our own home. But most importantly, they stretched conceived boundaries and instilled in us the faith that our species can surmount all problems in its aim to reach further. In the words of Edmund Hillary, "It is not the mountain we conquer but ourselves." Our species did not remain bound to the surface of our planet. As dangerous a face as our own own planet can present, it remains our home - our cradle. We felt the need to escape its pull and expand our reach to what was once the realm of the gods. And so it started. First we danced around our planet, then we set out to take a closer look at our closest friend in the sky - the moon. Take a moment to consider this momentous feat. All the time until this moment, whenever humankind had explored a new region of the Earth, it had always been setting foot on the soil of its own planet. But now, man was about to visit another world altogether - and nobody even knew if the surface would be rigid enough to support a landing. For this reason, NASA had to send a series of robotic surveyors prior to dispatching people there, in order to ascertain whether the dust on the moon's surface was too deep to allow astronauts to land. The results showed that a landing would be possible, and so, for the first time ever, a creature of planet Earth walked on the surface of a world other than its birth-planet. Homo Sapiens set foot where no living thing had ever been. Excited by these events, many thought that it wouldn't be long before we would see people roaming the red planet, an endeavour which has proved to be tougher than we thought. These were very exciting times for the exploration of our cosmic habitat. We were starting to find our way around this vast playground which had just come within our reach. Where man could not set foot yet, unmanned probes were sent instead, gaining reconnaissance on our behalf. Thus we learned about Mercury from Mariner 10, Venus from Venera 13, Mars from the likes of the Viking probes, and yet other unmanned explorers ventured even further out into the blackness of space. Some of these robotic spies have long been dead, such as Venera 13, which lasted only for a few moments before it succumbed to Venus' hellish environment. Others, such as Voyagers 1 and 2, are remarkably still alive, beaming back information as they approach the very edge of our own solar system, nearly 35 years after their launch! Each of the Voyagers carries a gold-plated audio-visual disc full of information about our planet, including the sounds of whales, a crying baby, greetings from people, and a musical selection. If the Voyager disk ever encountered an alien species, I would be most interested to know what they'd make of Otto Klemperer's interpretation of Beethoven's 5th symphony! Alas, at its current speed, Voyager 1 would need more than 70,000 years to cover the distance between us and the closest star, Proxima Centauri, so I think I'm going to give up on ever finding out. Such is the vastness of humanity's new frontier. And let us not forget that there is a lot we do not know even about the worlds orbiting our own sun. A lot of what we know has come from many busy bees which have been doing a lot of work for us, from the Opportunity rover which is still roaming the surface of Mars, to the Huygens probe which landed on the surface of one of Saturn's moons, Titan. To this date, this remains the most distant landing of any probe launched by our species. Meanwhile, the Cassini probe has enabled us to see liquid lakes of hydrocarbons on Titan, MESSENGER has become the first probe ever to orbit Mercury, and Deep Impact, as the name suggests, launched an impactor - not into a planet, but into a comet, so that we could learn about its composition and structure. This very minute, other explorers are venturing towards other worlds. Juno is maneuvering its way to Jupiter, set to arrive there in 2016. Dawn is currently orbiting asteroid Vesta and will continue to do so until the 26th of this month, when it will then depart for another asteroid, Ceres. Rosetta is on its way to a comet, which it aims to reach by mid-2014 and subsequently even land upon it on November 2014! New Horizons, launched in 2006, will reach Pluto in 2015 and will give us an unprecedented view of this enigmatic world. What a long wait for the scientists who built it! So you see, whilst for the time being the farthest humans are orbiting our heads upon the fairly close-by International Space Station, there are many sentinels exploring more distant regions of space for us. And today, to the delight of many, another robotic mission successfully joined this new class of explorers. 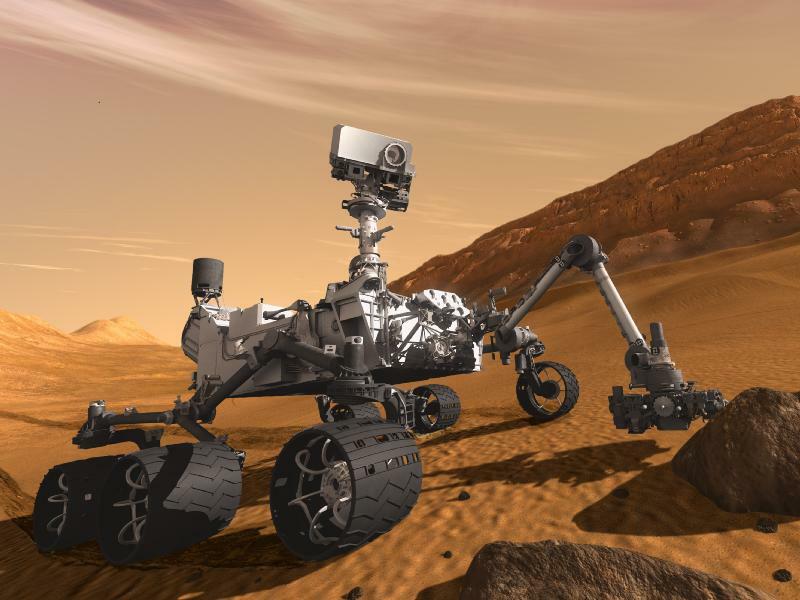 An inspiring marvel of modern technology, it is called Curiosity, and after a series of complicated maneuvers, it was lowered down on the surface by a sky-crane and landed on Mars' dusty-red terrain early this morning. Curiosity will try to find out whether Mars could ever have supported life, investigate the planet's geology and climate, and help us plan for a long-wished-for human mission to the red planet, in particular by measuring the different kinds of radiation present at Mars's surface, which present a hazard to humans. To this end, the craft that has been transporting Curiosity to Mars has also been measuring radiation exposure in the spacecraft's interior while it was on its way to the planet. Even more spacecraft are currently being planned, such as the European Space Agency's Jupiter Icy Moon Explorer (JUICE), whose aim is to study three of Jupiter's moons, Ganymede, Callisto and Europa, all of which are thought to have large quantities of liquid water beneath their surface. It will be a long wait however, as this probe's launch date is 2022. But if I'm still around wandering this planet then, I hope I'll be telling you about it. Space exploration underlines that most basic of human qualities, the unquenchable thirst for knowledge. So many uncharted territories. So many unexplored worlds - distant, yet within our grasp. Long may humanity's ingenuity and childlike curiosity continue thriving.